3.5 stars rounded up. In this seventh outing with TJ Jensen and clan, TJ agrees to assist with resort renovations at Gull Lake, for a friend of her father. He has recently had a stroke and needs someone there to watch over the renovations, make decisions about what has to be done, and keep a developer at bay. Having grown up in a resort setting, she is the perfect person for this task. Even better, she brings along family, friends and pets for this extended stay. Rounding out the group, is a parrot named Blackbeard. He belongs to the owner and he is one smart and chatty bird. Throw in a purported pirate treasure and some treasure hunters and this could be a great adventure. What they did not expect was to find a dead body in the attic the day they arrive. She knows the man was killed, but when the case is deemed accidental, she is wondering what the deputy is hiding. TJ sets to investigating what happened as well as trying to find information on the land developer who is trying to force a sale of the resort. This was a fun story. There was a lot going on with the younger sisters, treasure hunters, greedy land developers, environmentalists and a whole host of busybodies and volunteers in the small town. There are some rather quirky characters that add a bit of humour to the story. There is a bit of romance that causes some questions and confusion in TJs mind to round out her concerns. I like TJ, she is loyal, smart and persistent. I love the interaction between the characters. It is a wholesome, multigenerational series. The mystery had some starts and stops, some twists and turns, some red herrings and finally a surprise ending to it all. I really enjoyed this story and will be reading more from the TJ Jensen series. About the Book: Tj Jensen and her family head to Turtle Cove Resort for summer vacation, but their plans for rest and relaxation are thwarted when they find a dead treasure hunter in the attic of the resort’s main house. Initially vowing not to get involved, Tj quickly changes her tune when the Gull Island deputy on the case closes it after a bare bones investigation. All evidence points to foul play, and Tj’s determined to uncover what the deputy wants to keep hidden. 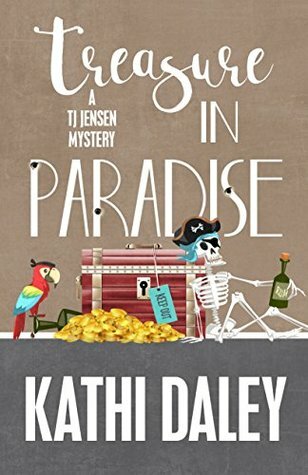 With the help of her best friend and a chatty parrot, Tj digs up a centuries old legend, a hidden map, and secrets buried deeper than a pirate’s treasure. About the Author: Kathi lives with her husband, kids, grandkids, and dogs in beautiful Lake Tahoe. When she isn’t writing, Kathi likes to read (preferably at the beach or by the fire), cook (preferably something with chocolate or cheese,) and garden (planting and planning not weeding). She also enjoys spending time on the water when she’s not hiking, biking, or snowshoeing, the miles of desolate trails surrounding her home. Join me on Facebook at Kathi Daley Books (www.facebook.com/kathidaleybooks) for updates on my books, photos of life in Lake Tahoe, recipes, contests, and giveaways. For weekly updates and contests sign up for The Daley Weekly Newsletter (http://eepurl.com/NRPDf). This is a cute idea for a mystery!! Great review, Carla! Wonderful review of this one, Carla. I’ve always wanted to read a Kathi Daley series. I love all the fun elements this one has. I haven’t read them all, but it is a fun series! This was my first and I enjoyed it. I liked the interactions between the characters.